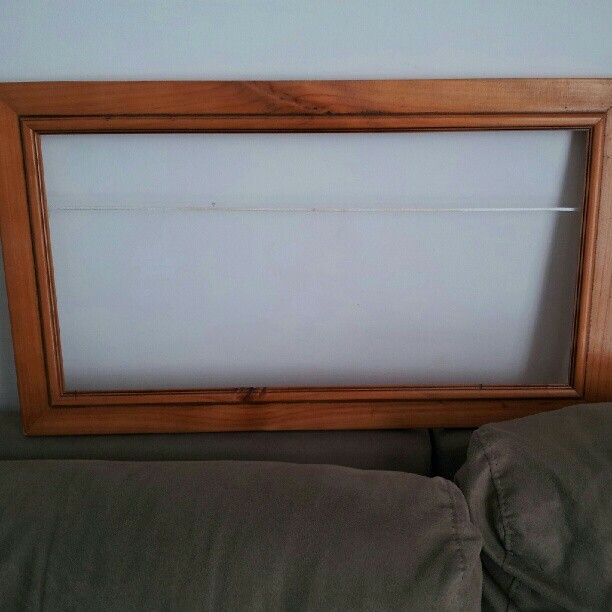 We have wanted a whiteboard for a while. I'm stingy though and kept planning on turning a picture into one. This weekend I finally did it and it was so easy! I got this picture from my sister in law about 4 years ago and loved it. 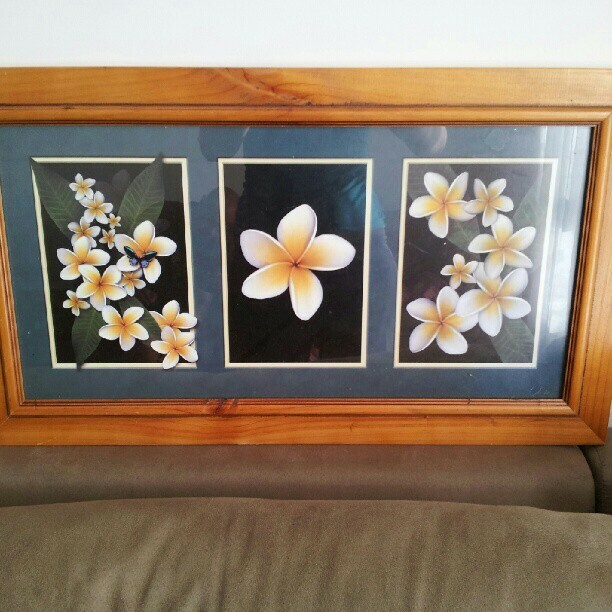 Frangipanis have been my fav flower for ages, but I am changing things up in my house. It was really easy to turn the picture and fram into a whiteboard of sorts. 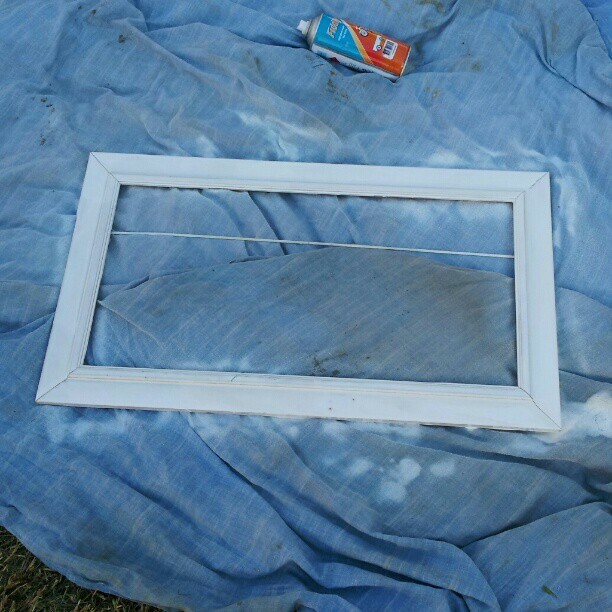 Next I gave it a good clean so there was no dirt, dust or grime on it then laid it on a sheet outside so I could spray paint it. Realistically I should have sanded it beforehand, as my husband kept telling me, but I am so impatient and decided I wanted it done now. 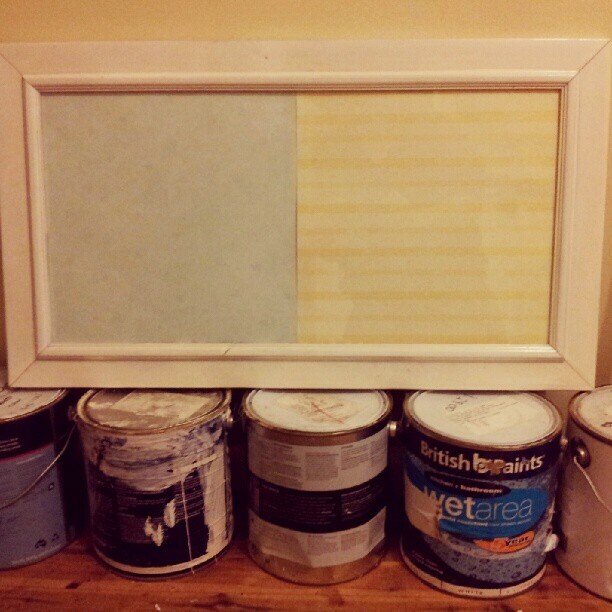 Once the paint was dry I picked 2 sheets of scrapbooking paper I had (I would have chosen pink ones, but since the board is not just mine I went for 2 more gender neutral colours) and laid them on the glas and put the glass back into the frame. It was a super easy project. As you can see from the paint cans we are in the process of painting too, so my new whiteboard has not yet made it to the wall but I already love it. One side is for things that are coming up/stuff we need to remember. The other side will be for things (excluding groceries) we feel we need or want. This way we can decide after 30 days if they are still a need/want and look out for them on special. I already had whiteboard markers which work great on glass. So I finally got my whiteboard for free. (I had left over paint from another project, the scrapbook paper was from my mother in law when she was doing a clean out ages ago and the picture was giving to me 4 years ago). 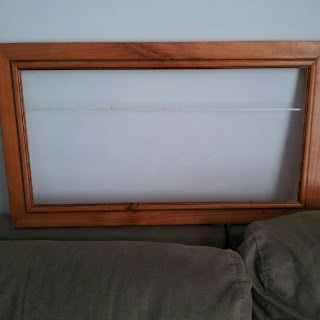 It is so easy to repurpose items you already have into something you will use. 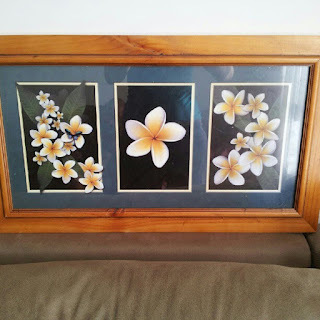 I have kept the frangipani picture in the frame behind the scrapbook paper if I want to use it as intended in the future.